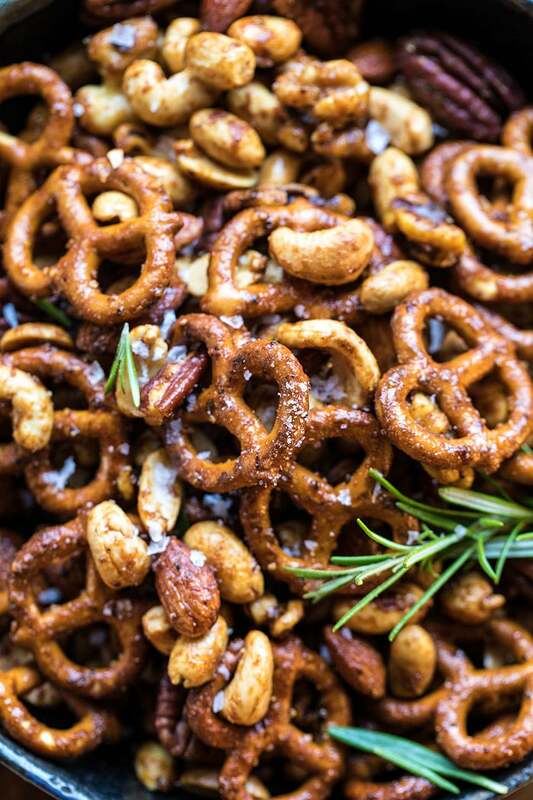 Sweet ‘n’ Savory Roasted Nuts and Pretzels. 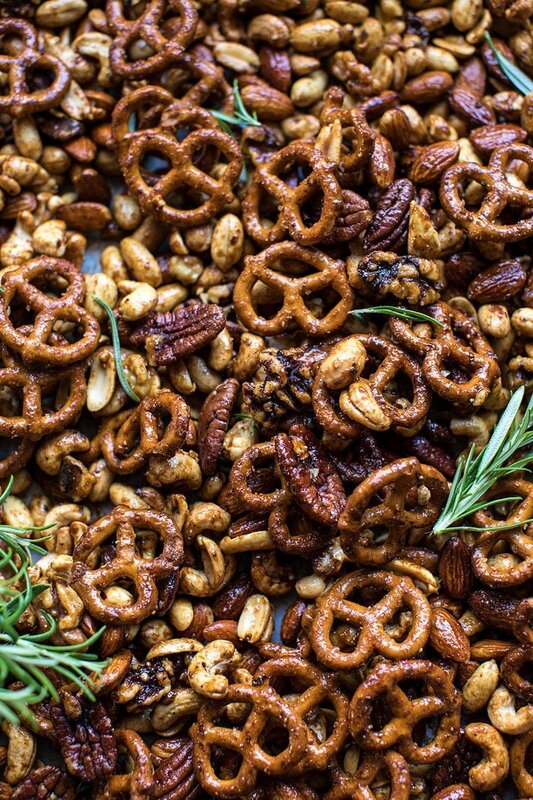 Everybody, meet the perfect last-minute holiday snack, Sweet ‘n’ Savory Roasted Nuts and Pretzels. 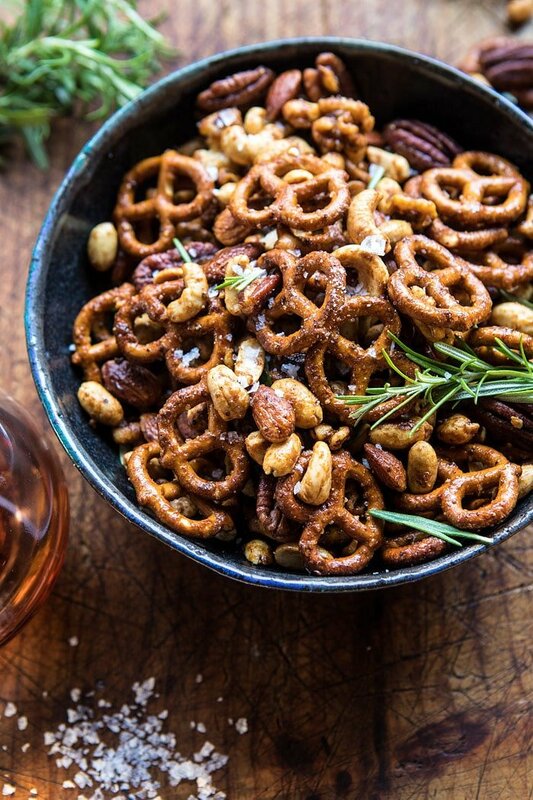 Not sure about you guys, but I am such a sucker when it comes to anything salty like nuts and pretzels. Once I start, I just cannot stop, and this snack mix is the worst of them all. Speaking of Thanksgiving week?! Oh my gosh, Thanksgiving is basically just one day away, I am so excited. Currently, my family and I our on our way to Cleveland to spend the holiday with extended family. We don’t normally head back to Ohio for holidays, but with my grandma’s passing in August, this was something my mom and her siblings really wanted to make happen this year. So the Gerard Fam is headed back to CLE for a few days. I’ll be mixing work with family time (as usual), but totally taking Thanksgiving off to cook a (hopefully) delicious meal and hang with family. We’re staying at my grandparents. Mom and I will be hosting around thirty + people for Thanksgiving dinner, so not exactly a simple meal, but I’m excited to just be cooking for people I love. Curious what you guys do for Thanksgiving? For our family, Christmas is always the more celebrated holiday with the most traditions, but I’m sure this year’s Thanksgiving will be one for the books. It’s a pretty big group, with many, many personalities, so it should be interesting to say the least. Let’s just put it this way, I expect to have plenty of fun stories to share come Monday. With so many people coming to dinner on Thursday, I know that having snacks all throughout my grandparent’s house is going to be a must. 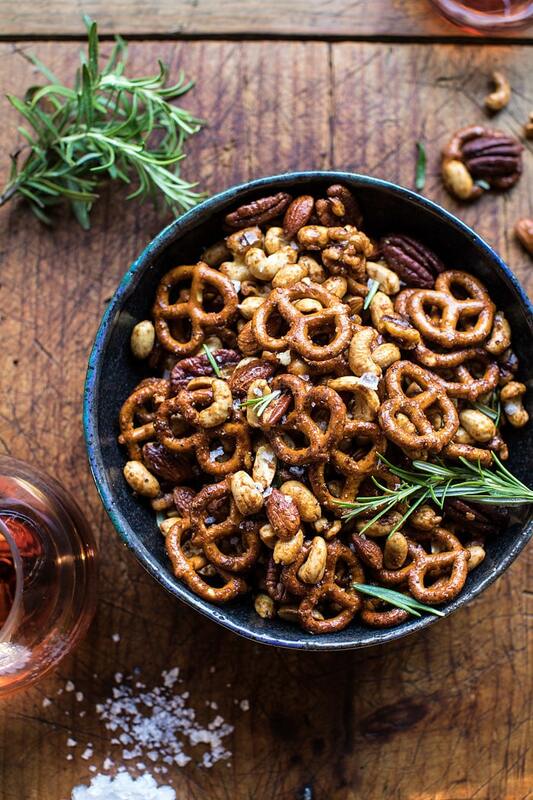 At Christmas, I always make my mom’s Chex Mix, but for Thanksgiving I like to do something just a little different. Chex Mix can only be eaten at Christmas…I have rules. Don’t judge. 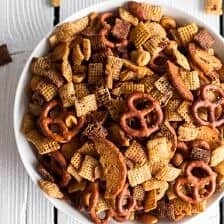 Here’s the thing, I still wanted that extra salty component that Chex Mix offers, but I thought it would be good to throw in a little heat, a little savory, and even a little sweetness. It might seem like kind of a lot, but trust me, it works. 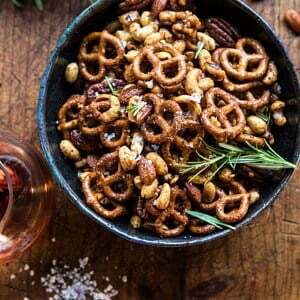 I used a whole bunch of raw mixed nuts (almonds, cashews, pecans, walnuts, and peanuts…the cashews are my personal favorite) along with the classic pretzel twists. I roasted the nuts until toasted, then added a little soy sauce for saltiness, some spices, plus a little maple syrup for a touch of sweet to balance the spice. Lastly I added some extra rosemary for decoration. Seriously, I’m really not sure snacks can get any better. These are beyond delicious, and as I mentioned, they’re pretty addicting. Stopping yourself from eating these takes some serious self-control. I know, that sounds a bit dramatic, but at least that was the case for me. Just make a batch and you’ll quickly understand what I’m talking about. 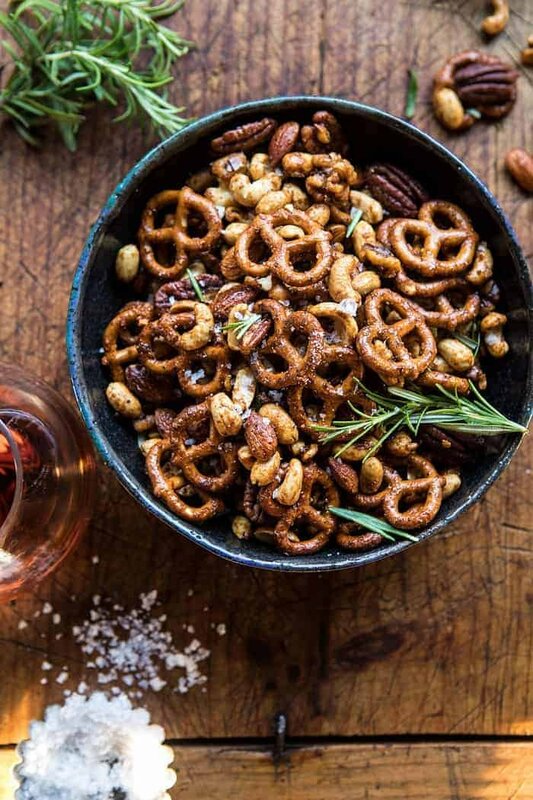 These are spicy, hinted with flavors of rosemary, touched with just a little sweetness, and extra salty…which is how all snack mix needs to be. My plan is to make a big batch tomorrow, I’m talking a triple batch (again thirty people + very hungry brothers). Then I’ll set the bowls of nuts/pretzels out around the house for snacking. My grandma always had candies and bowls of nuts scattered throughout her house during the holidays, so this feels pretty on point and in good memory of how she used entertain. Another tradition of my grandmas I’ll be carrying on this Thanksgiving? Setting the table on Wednesday night. I do this every single time I entertain. It’s one of the greatest tips my grandma ever taught me. Well, this and how to make her Dutch Baby (cookbook recipe), which yes, I will be making Thanksgiving morning along with this pumpkin spice french toast. Hoping you are all getting as excited for Thanksgiving as I am! PS. Do you have your menus set? 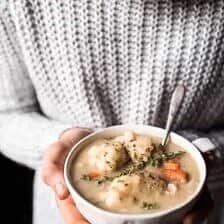 Are you making some HBH recipes? I cannot wait to hear about how everything turns out. My fingers are crossed that everything turns out delicious! 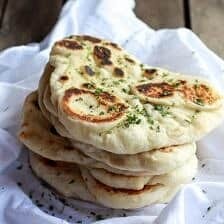 These are spicy, hinted with flavors of rosemary, touched with just a little sweetness, and extra salty. AKA they are addicting. 2. 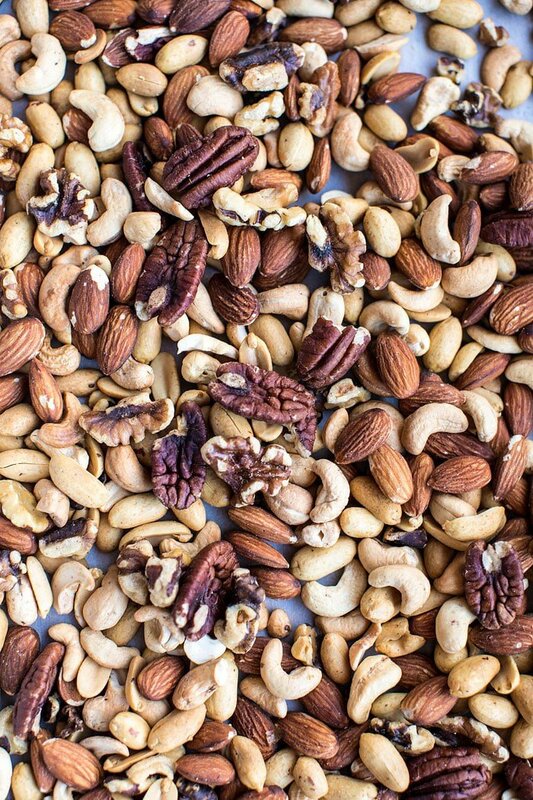 On a parchment lined baking sheet, combine the nuts and spread in a single layer. Transfer to the oven and roast for 15-20 minutes or until lightly golden and toast. 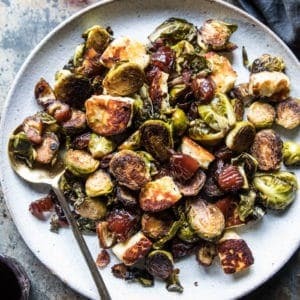 Remove from the oven and add the pretzels, butter, soy sauce, maple, rosemary, cayenne, chili powder, paprika, onion powder, garlic powder, and salt. Toss well to evenly combine. Return to the oven and roast for another 10-15 minutes or until the nuts are glazed. 3. Serve warm with additional rosemary or cool completely and store in an air tight container for up to 2 weeks. Sharing a bowl? Yeah, probably not the best option! PS. for all those looking for a healthy pumpkin pie recipe, I am sharing my all time favorite over on The Chriselle Factor today. Trust me, you need to give this healthy pie a try! I’m the same, if you put a giant party sized bowl of that mix in front of me – I’d still have the whole thing gone in minutes! Looks dangerously delicious! Haha yes! I am so glad you like this Rebecca! Thank you! Looks great – but the ingredients say maple syrup and the instructions say brown sugar instead! And happy Thanksgiving! Making the Salted Treacle Butter Apple Pie from your cookbook and trying to convince my mom that your Chai Spice Pumpkin Pie isn’t too far from the “simple pumpkin” that she’s looking for. Can’t wait to see how they turn out! Happy Thanksgiving!! I hope they turn out amazing for you Erica! Thank you and Happy Thanksgiving! There’s no brown sugar in ingredient list but the directions call for some? Got a chuckle out of your Chex Mix comment……same for our family, only at Christmas! Have a wonderful Thanksgiving. Thank you Joanna! Have a great Thanksgiving! I’d like to try this! Is it brown sugar or maple syrup? Between my husband and I, we have seven parents (divorce and remarriage) and because we are both only children and have the one and only grandkid they all insist on coming over. However, they don’t all share the same political views, so we stagger them throughout the day with a number of friends we want to see too. That means a lot of cooking for me (don’t worry I enjoy it). Your recipes, from snacks to drinks to sides, have made me a hero for the past few years. I think the all-time favorite has been the baked brie with seasoned pretzels, but I am going to give this one a try too. Thanks for all the great recipes and have a safe and happy holiday! Sounds like a busy day, but I am sure it is nice to see everyone! I hope you love this recipe Tibby! Thank you! Ingredients says maple syrup. Method says brown sugar. Which is it? I have to make these today!!!!! Your endless creativity in the kitchen is as mind-blowing as ever! Thanks for another amazing recipe, Tieghan! Delicious looking recipe! 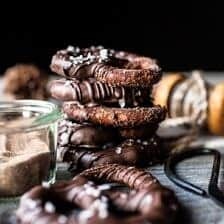 Do you think this recipe would be fine without the pretzels (or do you have any substitute ideas)? 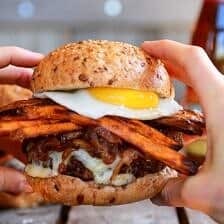 I don’t have any on hand but would love to make this today! Thanks! 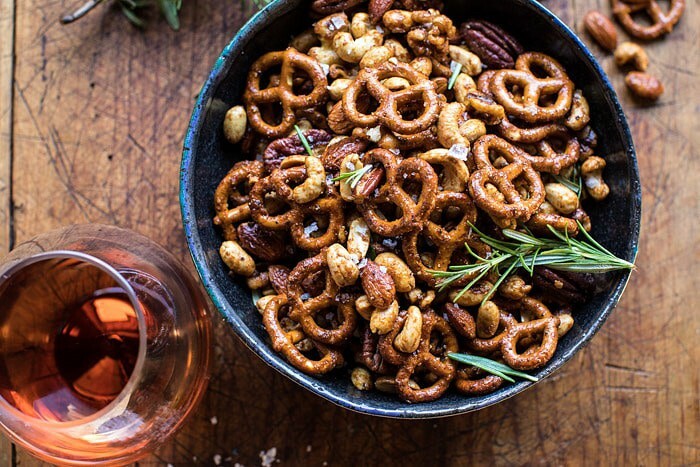 This nut mix looks perfect for the holidays! I hope your trip goes well and you and your mom enjoy spending time together and making dinner for everyone (would your Nonnie in mind) ☺️. My mom is doing most of the cooking for thanksgiving but I’m making your chocolate chip pecan cookies and maybe a vanilla bean apple tarte tatin from Bon Appétit. But I wanted to make one of your recipes for breakfast. What do you think? Should I try your pumpkin chocolate chip pancakes, apple stuffed pretzels, or apple cinnamon pull apart bread (from this fall)? I really want to make your pumpkin French toast but don’t have any brioche (and am not sure if I should make homemade). Is it work making the brioche? Or should I go with one of your pumpkin or apple recipes? Haha It’s only about 5 people here, but I wanted to make a nice (but stress free) breakfast. hmm I totally love all of those recipes, but I am thinking either the pumpkin pancakes or the pull apart bread! Which ever you make I am sure it will turn out great for your family! I hope you love the pecan cookies, Kristin! Thank you and Happy Thanksgiving! I am so happy you enjoyed everything! Thank you! It looks so good! Probably one of the most addictive treats ever 🙂 Have to try it! Yes! I hope you love these Natalie! Thank you! Having your shopping done probably took a weight off your shoulders haha! I hope you love the casserole and the book! Thank you Liz! I just finished making this for my family. I made one batch with mixed nuts (tree nuts) and one batch with peanuts, sunflower seeds and pepitos. We have tree nut allergies here, so I am always making corrections so no one feels left out of the delicious food experience. We all like the peanut version VERY much! It works great! 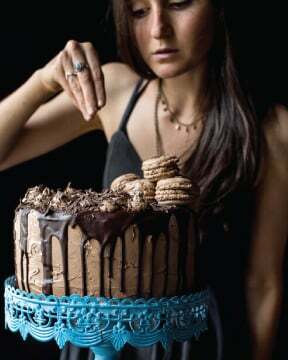 Thanks for your recipes and fun commentary. Many blessings to you and your family this Thanksgiving. That is so great! Thank you Sue, I am so glad you and your family loved this recipe! Thank you Laura! I hope you did as well! Made this for Thanksgiving as an appetizer and my family LOVED it! I already got requests to make this for Christmas Eve. Thanks for the recipe. P.S. I love your cookbook and can’t wait to cook my way through the whole book. That is amazing! Oh and I am so happy you are loving the book!! Let me know what you make! Thank you Neha! i made this last nite and OH MY GOODNESS….SOOOO GOOD!!! sadly i forgot to buy pretzels…but i had some wheat chex i used instead…..DELICIOUS!! definitely keeping this in my “snacks to make”…. 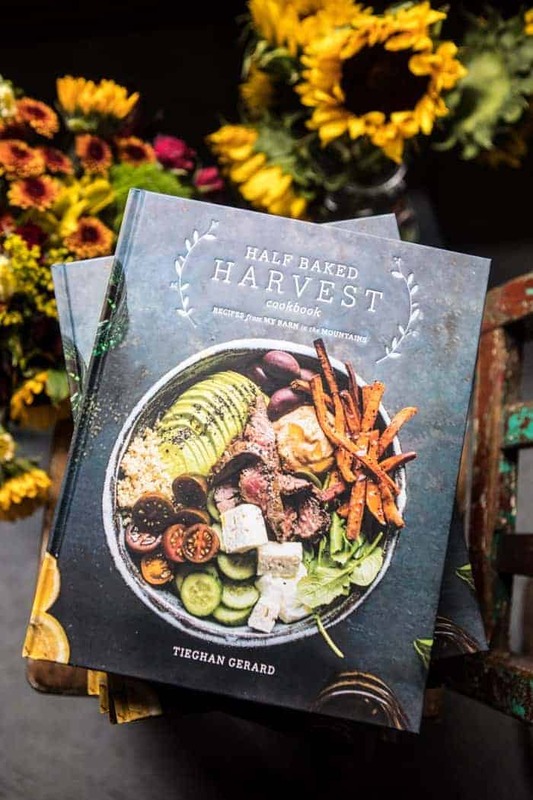 tieghan~ keep those fabulous recipes comin’!!! you are a rockstar!!! Thank you Lisa!! So glad you loved this! It burned! I only roasted it for 9 minutes after I tossed the peanuts and pretzels with the butter, syrup, soy sauce and herbs & spices and something in that mix burned. Now the nuts and pretzels are coated with whatever burnt and have a charred taste. And I didn’t really taste the sweet, just the cayenne and rosemary. I cooked it at 350 degrees and even had an oven thermometer in my oven. I’m guessing it was the rosemary (I did finely chop it) or the soy sauce that burned. 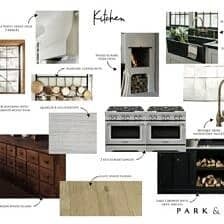 I want to try making this again, but for my personal taste I will increase the maple syrup for a sweeter taste and only bake for 5 minutes after adding the pretzels, liquids and herbs & spices and see if that helps with it not burning. BEST SNACK EVER!!! Omg! I’ve made this 3 times and every time it gets fantastic reviews!!! I cut the cayenne back to 1 tsp and it’s plenty for us. Thank you for the recipe! Thank you so much Lori! I am so glad you loved this recipe! 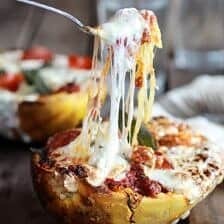 Another awesome easy recipe! Made this as a little snack for Xmas and they were so easy but looked expensive if that makes sense. Spicy with a touch of sweetness…so addicting!!! My only comment would be to check the nuts at 10 mins bc I set my timer for 15 and they looked a little too dark – taste was still good but another minute or two and they would have been burnt. Thank you so much Beata! I am so glad you loved this recipe!